Chechen Strongman Spars With John Oliver Over Lost Feline : The Two-Way The fur started to fly when Chechen leader Ramzan Kadyrov told his 1.8 million Instagram followers that his cat is missing. Then the HBO host got involved and turned the saga into Internet catnip. 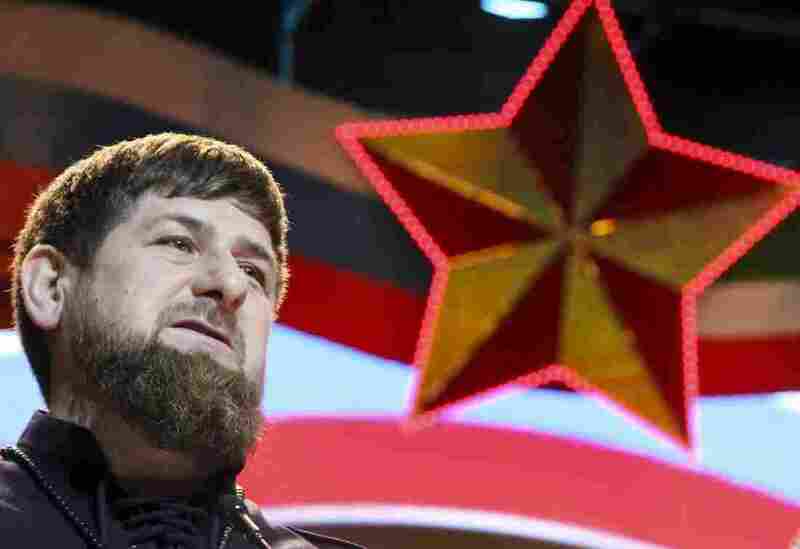 Chechen regional leader Ramzan Kadyrov speaks as he attends celebrations marking Defenders of the Fatherland Day in Chechnya's provincial capital of Grozny, Russia, in February. Chechen strongman Ramzan Kadyrov and HBO host John Oliver are locked in a public spat over a lost cat. First, Kadyrov — the leader of the Russian republic of Chechnya whose forces have been accused of torture — asked his 1.8 million Instagram followers for help finding his missing cat. "We have completely lost our cat," the staunch ally of Russian President Vladmir Putin posted, according to a translation from The Guardian. "We have begun to seriously worry." He appealed to his followers for any information about the feline's whereabouts. Then, Oliver picked up the news for a segment on his satirical current events show, Last Week Tonight with John Oliver. Oliver pokes fun at Kadyrov's prolific Instagram feed, which, as we reported, runs the gamut from mundane to completely outrageous — including a video where he apparently wrestles a crocodile, and a trailer for a Hollywood-style action film in which he stars. Kadyrov's workout routine (mainly weightlifting and boxing) is also a regular feature. "It almost makes you forget he was once accused of beating a prisoner with a shovel handle before executing him. Almost, but not quite." Oliver's conclusion: "For the good of the Chechen people and stability in the whole region, we have to find this f*****'s cat." He urges viewers to join a campaign called #FindKadyrovsCat — basically designed to taunt the strongman by flooding him with pictures of random cats asking if they belong to him. In response, the apparently incensed authoritarian leader altered Oliver's picture to remove the cat and replace it with a Putin T-shirt. "I'm tired of jokes. I want to care for cats in Chechnya. By the way, Putin is our leader!" text on the photo reads. Kadyrov says Oliver's campaign prompted a big response. "I receive lots of photos. Some people say that they saw the cat in Vladivostok, Japan, Iceland, New Zealand, and even in the Oval Office of the White House!" the caption reads. He adds: "I am grateful to all, but this is NOT my cat." "He also needs to meet with friends, mingle and share news. By cat rumors he has in our district a familiar she-cat with which he's going to start a family. I'm sure that after spring affairs, the cat will return to native walls. Perhaps, he'll bring his sweet love with him."